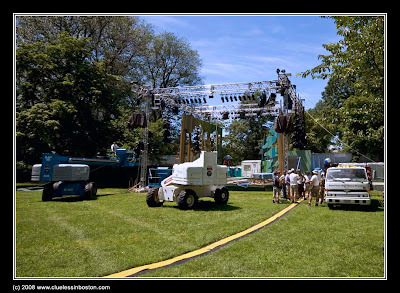 Workers erecting a stage for the upcoming Shakespeare production of As You Like It at the end of July on the Boston Common. The stage is being set up near the Parkman Bandstand on the Tremont Street side of the Common. Wish I was going to be there for the production- I hope YOU go and take some pix for me!